Step 4. Make sure you have the Select Tool active, then click and drag to highlight a section of text. Step 5. Click the "Copy to Clipboard" button under the Selection tab in the PDF Converter toolbar. Step 6. 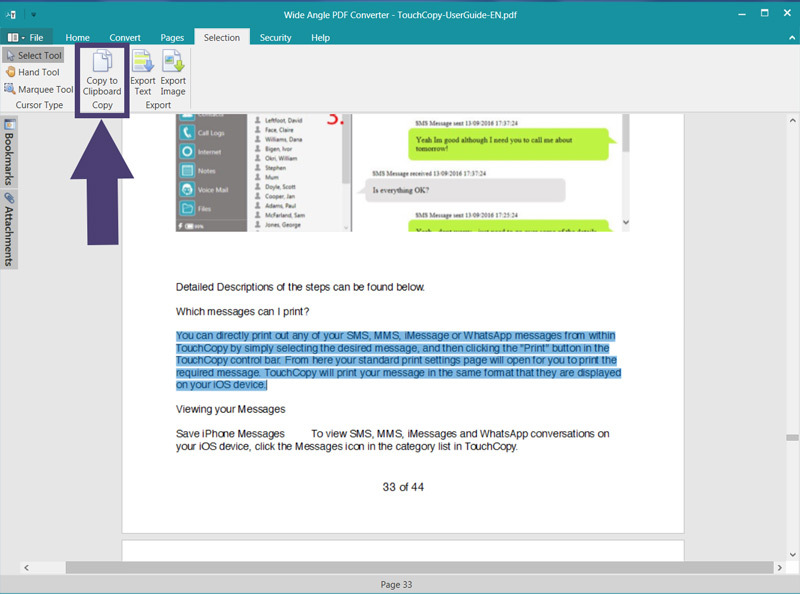 Right-click and Paste the selected text into another application or document. Many times, you may only need to copy or reference a couple of lines of a PDF document, so it makes sense that you should be able to extract this small section for use in other applications or files. Wide Angle PDF Converter allows you to copy text from PDF easily. Once the selction has been copied, it's usable in any application which allows you to copy/paste. Simply right-click and paste the selection from your clipboard into any other application or document.